Mistral has streamlined and repackaged their fragrance collection. Three older fragrances — Lychee Rose, Lavender and Verbena — have remained, and two new fragrances have been introduced: Côte d'Azur and White Flowers. Côte d'Azur (shown) ~ "Celebrate French tradition with our exquisitely refined fragrances that capture the familiar scents of Provence with a touch of the unexpected. Our entrancing scent perfectly captures the fresh breezes, sparkling blue water, sunny sky and lush foliage of the French Riviera." With orange, lemon, lime, jasmine, orange blossom, aquatic notes, peach, sandalwood, coconut and musk. White Flowers ~ "Our captivating bouquet of fresh blooming jasmine, tuberose, gardenia and sparkling orange blossoms evokes pure feminity [sic] and grace." Additional notes include green notes, raspberry, peach, musk and coconut. 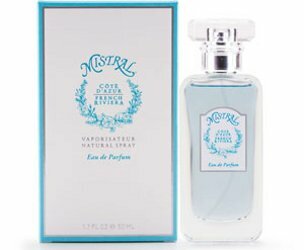 Mistral Côte d'Azur and White Flowers are $50 each for 50 ml Eau de Parfum. Really enjoy their soaps, but have never tried a perfume; have you R? Ack. Can’t remember! These new ones are at Anthropologie too so I will look for them, although it’s darned hard to find anything specific at Anthropologie. Ah, then yes, that’s just what it means. At the moment, they still have the Wild Blackberry soap but not at all sure if they’re just selling out remaining stock or if they mean to keep it in production. I keep my bottle in a dark drawer, but now I feel like I should put it in the fridge!